We specialized in manufacturing and supplying a vast range of sturdy Chipboard Screws that are widely used to fasten low, medium and high density chip boars. 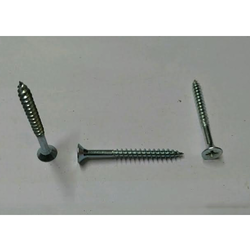 We also customize these chipboardscrews as per requirement into self tapping, so that there is no need to bore holes first. We offer huge quantity in various sizes specification to choose from. With enriched industrial experience and knowledge, we are providing an excellent range of Chipboard Screw.